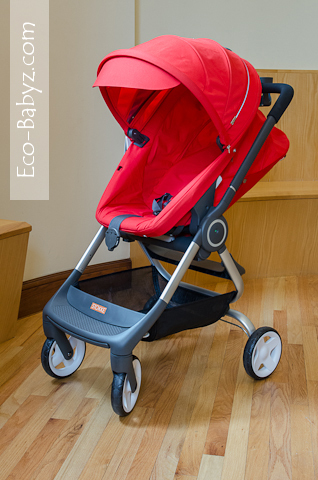 We are so excited to present to you one of STOKKE's new strollers this season! The STOKKE Scoot is a versatile full-size stroller that is designed to bring baby closer to you and to make life as a parent a little easier. 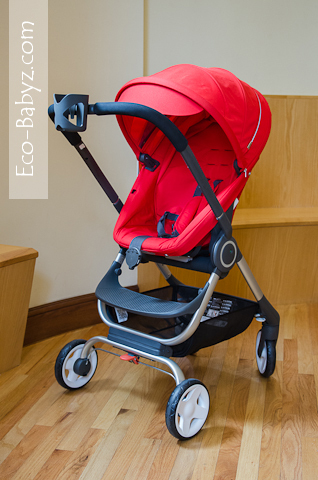 With a silky smooth ride, easy one-hand fold, and generous storage, it's everything you need in a stroller and more. This stylish head turner and paparazzi magnet has a luxurious seat that can have the baby face out or face you. Don't worry, the canopy gives your little one plenty of privacy from curious strangers and photographers. The seat of the Scoot, oh the seat! It is by far the most comfortable stroller seat I've seen to date. Not that my 15 month old can say it (my 4 year old can!) - but I can see how comfortable he is, cradled in it and as if embraced on all sides. The most exciting thing about this seat? The fact that you can reverse it to face in or out! If you know me, you know this is a feature that's very important for me in a stroller. For several years I've compromised for a stroller with an easy fold even though it didn't have the seat I wanted. Now there is both in one! You see, I really love facing my baby, I love talking to him, pointing things out, looking at his hilarious facial expressions - just enjoying the interaction. As a babywearing mom I do spend a good part of the day with him in the baby carrier with me, cooking away in the kitchen. Every day. I love babywearing, but my back needs a break too. Especially after that stair accident, it's not the same anymore. So for strolls and most travel situations, I just love to have a stroller where the baby can face me. Now that we've tried it, I know he loves that too, he no longer has to go out of his way to make eye contact with me when he craves some bonding time. The seat is plush, soft, cocoon like. It has a higher seat position and can be used as a high chair in cafes and restaurants. It only has one recline that's released with two clips on the back of the seat, but I do find that all that's really necessary is an 'awake' and a 'sleep' position for baby. Anything in between isn't exactly vital in our experience. So you end up with four seat positions: active baby facing in or facing out, and sleeping baby facing in or facing out. Covering the seat is a very generous, sturdy canopy. Even the canopy on this stroller is so precisely engineered, it doesn't feel 'cheap' like most canopies I've come across. It also serves as a support when the stroller is folded and has a neat little 'foot' for the stroller to rest on so that the canopy doesn't get dirty. The canopy visor can by flipped under the main canopy when you don't need it. There is a zippered flap that opens up to reveal a mesh window for ventilation on hot days. 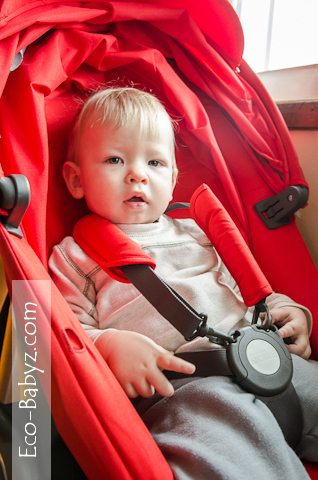 Of course, there is an adjustable five point harness to keep your baby safe. In case you're wondering, my four year old has trouble opening it, so it is toddler proof for little escape artists! Below, you can see the seat facing in and out. One of my stroller pet peeves is insufficient storage space. The Scoot definitely makes up in that category for all the storage deprivation we've experienced the past few years. It has a huge cargo basket that's not just big, but easily accessible on all sides. The higher seat position gives you plenty of vertical storage space below the seat as well. You can put a really big diaper bag in there with no problem. The generous storage room is the best travel feature! Boy I wish I had that much storage when we were lugging around two kids on our Washington D.C. trip, complete with lunch and water to last us all day. The STOKKE Scoot is equipped with front wheel suspension for a smooth ride for baby. To sum it up, I am very impressed with the handling of this stroller. I can literally steer it and push it with one finger. My four year old can easily push her brother around in this stroller as well. The adjustable handlebar makes this even easier - it's absolutely perfect for us considering I am 5'2" and my husband is 6'2"! The handle bar is low enough for my four year old to push the stroller around. It's not an all terrain stroller, but suitable for most urban and suburban situations. You might not take it to the beach or off-road, but it would handle some lawn just fine. The STOKKE Scoot weighs in at 26 pounds with the seat and has a seat weight capacity of 50 pounds. I've had a stroller that had the exact same weight before. It was bulky, cumbersome, and a general inconvenience. The Scoot weighs the same but feels lighter because it is so well designed. The one-hand fold and the fact it stands on it's own makes up for it being in the higher weight range of the lightweight stroller category. Would I fly with it? Probably not, but only because I wouldn't want the stroller destroyed! It is great for travel and I would not hesitate to drop it in our car trunk. It will see a lot of road trips this spring and summer! The fold of the stroller is so important to me. I have had one that was such a pain to fold that my husband declared he will never use it and I have to put it in the trunk myself. Needless to say we got rid of that one fast. 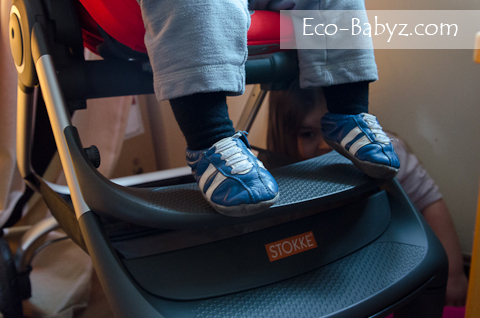 The STOKKE Scoot is very easy to fold, especially after a few tries. You really only need one hand. Retract handle and canopy, engage the break, pull up the seat, press and fold. All this can be done with baby in one hand. I am very petite and not the strongest of people and I can do it just fine. Of course the Scoot demo video makes it look even easier because a tall male does it. In our video I had a little trouble with it because it was only my third attempt at the fold and I forgot to engage the break. I was actually pretty surprised that such a roomy, full size stroller can fit in such a neat package. The stroller is large vertically, but has a small footprint. I can easily leave it standing in our super tiny entryway and it does not get in the way. I think everyone can agree that with the debut of their first stroller, the Xplory, STOKKE grabbed the 'stylish stroller' niche. The Scoot is certainly in line with the stylish modern stroller image. It's going to turn heads everywhere you go, I can guarantee it. It comes in seven colors, brown, red, dark navy, purple, beige, light green, and my favorite - black melange (closely resembles dark grey asphalt). 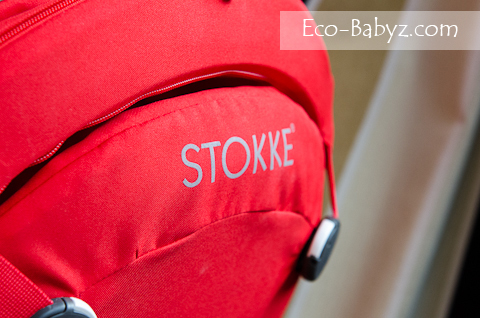 The STOKKE Scoot comes standard with a parent cup holder, mosquito net, and rain cover. There is also a car seat adapter available ($79.99) that works with Peg Perego and Maxi Cosi car seats. There is no carrycot for the Scoot, but their new Crusi stroller has a bassinet and a second seat option for a sibling. I'm sure some of the STOKKE Xplory accessories may also be used with the Scoot, such as the Foot Muff, Stroller Parasol, and Changing Bag. To Make It Even Better: As with any baby gear product, we felt like there is a little room for improvement with the Scoot. The first issue we ran into with our fifteen month old is that his legs are too long to fit into the seat like an infant, but a tad too short to reach the highest setting of the footrest (photo above of him trying to reach it). I do wish there was something to support those little legs for babies about 12 to 18 months at the in-between stage. Not a deal breaker, but it would make for a more comfortable nap. Another minor concern is that with the seat facing out, the parent cup holder interferes with the recline - just gets in the way a little. I do wish the recline was easier to adjust, I find myself needing two hands to do it - but it's something I can live with. 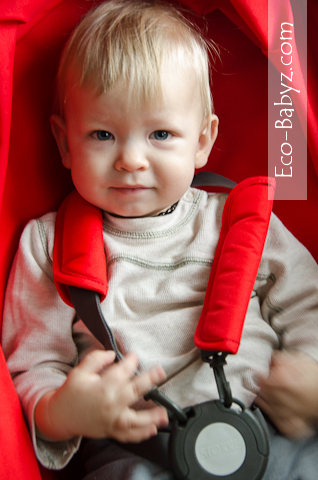 The five point harness can be hard to open and close, but it's a good thing for toddlers and keeping them safe. Considering all the things we love about the Scoot, it's [very] easy to overlook these little inconveniences! We like to be honest with our readers, so we want to give you the whole scoop. Feel free to ask me any questions you may have in the comments! Retailing for $699.99, the Scoot is certainly a luxurious stroller that is not in everyone's budget. It's not something that we would afford, I admit. Would I cut a few expenses and save up to buy this for a baby? I would consider it. Would I buy it if our income had more wiggle room? In a heart beat. If I was having my first baby, I wouldn't hesitate to put it on a baby registry for several guests to pitch in on. It's one of those high quality baby gear items that you can invest in once without regrets. Don't forget that the resale value for a used STOKKE is pretty good too, so you will get some of your investment back even after your kids are done using it. I honestly, highly recommend it if it fits in your price range. Quite simply, the Scoot is a-m-a-z-i-n-g! The STOKKE Scoot feels like a very complete, thought-out stroller. The attention to detail and precise engineering is evident from wheel to canopy. It really takes into consideration everything that a parent and their baby would desire in a stroller. Win one! We've teamed up with fifteen fabulous bloggers to bring you the STOKKE Scoot Stroller Giveaway! One reader will win the Scoot in black melange! Disclaimer: I did not receive payment for this post. I was provided a sample of the product for review purposes. All opinions are genuine and my own, as always. May contain affiliate links that support Eco-Babyz at no additional cost to you. I love how the ride just looks so smooth! Must be the suspension & wheels! Also, the seat looks comfy and secure with a cool hood! Footrest is the bomb too! I just love the looks of this stroller! 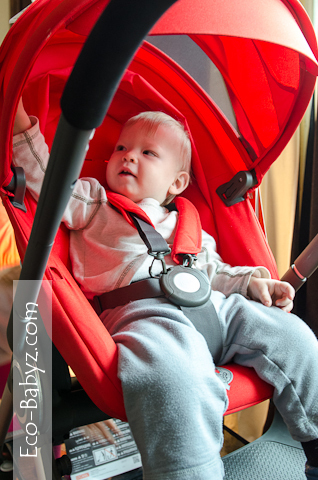 It looks lightweight and very easy to use and set up when in a hurry or busy with kids. Thank you for the review! This stroller looks so amazing! I absolutely love that it holds up to 50 pounds and also that the seat can face towards you! It's so sleek and great to look at as well! this stroller looks amazing.. something i def. need and want for my new baby in april. compact, stylish, easy. I love that you can face baby either way! How versatile, yet lightweight. Love the handle bar height - my husband is 6'8" and it looks like it would be easy for him to push. Fantastic review and really appreciated how you showed all the features clearly in the video. I live in NYC and can see myself easily maneuvering the sidewalks and subway with the Scoot. thanks for the review. i've been waiting for a good review from a real mom! Looks like a great stroller design, and I love that you can have the seat facing either direction. Also, the adjustable handlebar is a must as my husband is a lot taller than I am. I love that the stroller is lightweight and easy to fold. I also think it is great that the seat can face towards me. It's a beautiful stroller. I love how you can make it rear or front facing! Why don't more strollers come with this feature? Love it! I am loving this stoller.. I have always wanted to try out the Tripp Trapp chair.. :D Cool! awesome product! thanks for giving us the opportunity to win one! I love this stroller. I like that it seems easy to use and can be used for awhile. i have large kids, so the 50 lb limit is very important. i also like the easy looking harness- some of them get stuck and this one looks high quality. i love the easy fold, the design and how long it can be used! awesome video! What a great review! I like how the handle and seating is higher than most strollers. I also like that they have a variety of colors to choose from. Thanks for taking the time to do the review. I love the simplicity factor! The stroller looks so comfortable for the little ones and its not that huge its just a good size to take around. I love the reversible seat, suspension and the easy/standing fold! Doesn't hurt that it also looks amazing, too! I love how accessible the storage is! That is not always the case with a atroller! Wow! As a mom I can see where the desire for this stroller is! It can really grow and be useful past infancy. Thanks for your review! I loe that I can see my kid instead of just the back of their head! I love how compact it is, and that it holds up to 50lbs. Great review. 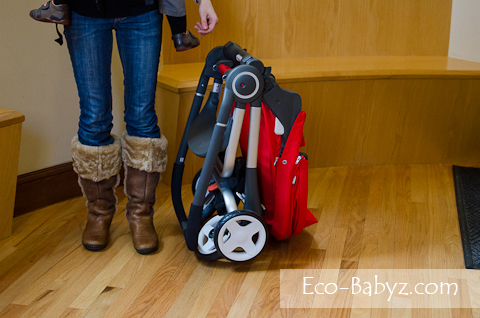 Love the look of this stroller and how compact it can be folded up. We are looking for a stroller that will fit into the trunk of our car plus any groceries we need to pick up, so we will have to look into this stroller. Love the Red........ I love how lightweight it is that is the best feature to me. Easy to use and compactable. it looks great and I love that my 3.5 yr old could still use it! my son is on the tall side though so I'm wondering if his legs will fit. I think even a taller child would fit fine because the foot rest goes down easily to accommodate longer toddler legs. Do you want me to take a measurement for you from seat to the top of the canopy to see if his torso would fit fine? :) It would be nice for you to try it with him, but I don't think you'll be able to find it anywhere in stores right now. My favorite features are the adjustable handlebar and the easy folding. Thanks so much for a thorough review! I have a stroller that faces both front and back. It by far the best stroller option. unfortunately my stroller doesn't fold up very compact at all unlike this Skokke. In fact, I have trouble getting in in the back of our Jeep and Its not a small car. I have to say, the facing in or out feature and the simplicity of the look is great. I love that this is face-in or face-out! This stroller looks amazing! I love how it sit a little higher than traditional strollers, and the fold looks pretty compact considering the stroller size! Thanks for the review! I love the positioning in this stroller. Thanks for the review! Your babe is meant to see the world! I love the look of it and the one hand fold! It's rare to get a one hand fold with a rear/front facing stroller. I love that it can hold up to 50 lbs and that it can face you! WOW. Wonderful review - I love the fold and appreciate the storage basket! I love the bright color and storage space! This stroller sounds awesome. I love that it has a higher seat position and therefore can be used as a high chair when out and about. The padded harness is one of the most comfortable looking harnesses that I have seen. Also it folds up into such neat little package that can be easily stored or left in the car without taking up all the room. I love the overall look of this stroller. The black color is nice but I would be partial to the red. This thing is awesome! I am expecting a new baby in july and this would be so nice to have. Thanks for the review as I had never heard of Stokke before. This would be so helpful for any mother, I wish they had these when I was having kids. This stroller looks great! I have a similar one but its a double. Would really love a single tho for the times I just have one kid with me! Also it seems like a durable stroller and would last many years. I think this stroller is amazing. I love how easily it folds up. I also like that it can either face in towards you or out towards the front. Love your products. Nice to see variations on strollers and beds. this is so freaking cool. it's seriously exactly what i was telling another mom i hoped to get for our next baby! parent facing, folds up small, totally awesome! I am expecting twins in a week and this product would make life so much easier! i love the care! what a cool design! the adjusting height is really great, cause i'm tall. This stroller is exactly what my wife and i are looking for. Compact, easily transportable and great looking. Beats our jogging stroller we lug around everywhere. I absolutely love how compact the stroller becomes when collapsed. One of the huge downsides to having a decent stroller is often that they remain a total beast when collapsed..the Scoot looks like the answer to that. it looks so portable and contained! Oh if only I could have this stroller it would make going out so much easier. and I love the color and the features on it. What an amazing stroller! I love that baby can face in and out. The easy and compact fold up is also amazing. Stokke has thought of everything in this stroller! What an amazing stroller! I love the adjustable handle height, the amazing new footrest, and how compact it folds! I think my toddler would even love this stroller! 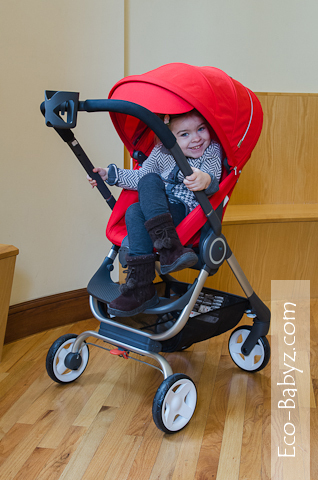 I love the adjustable handle, the amazing footrest, and the compact fold of the stroller. I think my toddler would love this stroller! Love that the seat is so versitle. My favorite feature is that the child can sit high up. You did a thorough review. For the high price range these strollers fall into, I find the only downfall to be the weight. 26lbs is a lot. Possbily not for able bodied, healthy moms and dads. But with herniated discs lifting in and out of car...that is a lot of weight. But not my problem.....trying to win for my hardworking sister that teaches special education to,students that need to be retrained due to,their violent outbursts. She deserves a qualtiy stroller. The different positioning, the way you can adjust the handle to different heights, how easy to fold up it sounds like the Mercedes of strollers! I love the weight of the stroller but most of all i love how it is actually compact unlike alot of strollers that say they are but arnt!! Everything about this stroller is AWESOME!!! I love that you have the option to seat your child facing OR away from you. amazing! love it! love the one hand fold , how you can switch baby to look at you or not , the style the compartments! what is there not to love! Great review. Looks like a great stroller. I love all of the features like reversible seat, easy small fold, adjustable handlebars, big basket, etc! Everything about this stroller screams safety and style. The materials are not cheap looking and frankly, I feel like I'd be the envy of playgroup pushing my little one around in this! I've been trying to figure out a good end-all stroller now that my kids are a little older and don't need a full on tank anymore, this looks perfect!!! I love this one, I like that it has more storage than some of the other strollers we are looking at, with 3 kids storage is a must and with 4 I am sure it won't be any better LOL. I also love that it has a bigger sun shade than some others because being in SoCal sun is a big worry! Love it. Wow! It looks like it has everything I wanted in a stroller. Even the height is right :)Off to try to win one! This is a great Stroller, I was my daughter to school a few days a week and this looks so comfy. I wish they made Adult size ones because this would be great for special needs children too. This looks like a great stroller. Thanks for the giveaway. This is an amazing stroller !!! I love how versatile it is and also like the 3 point harness as well. Would looooooooooooooooove to have this stroller. This was such a good video demonstration of the stroller. Thank you. I was especially interested in the folding of it, as many strollers say one handed fold but really aren't. This one looked pretty easy. I also love the space underneath and how easy it is to access it. Love that she could do that one handed and it does look like a smooth ride and easy to handle! Great video of the stroller, I like how this stroller folds and is for on the go. Also has room for things you have to bring along for the kids! This stroller is so functional! give you plenty of options for your baby and the fat that it can be easily compacted is wonderful! The stroller is perfect,i can take it anywhere without a the hustle of heavy weight,so i can carry it myself :)plus,the model id modern and just great,love it.. it's ideal for an independent mom like me. I really love how small it folds up. I also am a huge fan of the seat being able to face either direction. My babies are happier when they can see me when they are little. This is such a sleek, gorgeous looking stroller! I like how it can hold up to 50 pounds and it's light weight. The way you can fold it up to take up little space when traveling or at home in a closet. Why is it like impossible to find a stroller that has a seat that lays flat?! My kids always prefered to lay flat while napping in the stroller. The Scoot is pretty close to flat and my son looks very comfortable in it. In the photo where the seat is reclined, there is not baby there. When the baby is actually in the seat it is a flatter recline with the weight of the baby on the back of the seat :) Oh, and the STOKKE Crusi and Xplory both have the bassinet option, which is perfectly flat for newborns and infants. I love the compact fold, I have such a small car it would be perfect! Your little ones are too cute!! Thanks for the review!! COMMENT FOR RC NAME: ANDREW L.
I love how easy that looks to fold and carry. This would be perfect for travel. The harness is great too, our son can easily unsnap and get out of a traditional belt system. I like the easy way that it folds up with one hand and that it folds small enough to fit into a small car. I also like it fits a child up to 50 lbs. I really like how it folds up! This is a nice looking stroller! This stroller looks so functional and stylish... I like how compact it is for easy folding and keeping in the trunk or closet. This would be great for my new Grand-daughter. we have a small car and have trouble taking her current stroller with us. Thank you for the wonderful review! I would LOVE to get this stroller. I love the fact that it can be front or rear facing, the easy for folding, and that it looks like it moves/glides so easily. What a gem! The Scoot stroller looks great and has so many needed features. I like that the seat faces in or out, I like the adjustable handle and generous sized canopy. This looks awesome and I need a stroller! It's quite cute how you involved your kids in making this video. 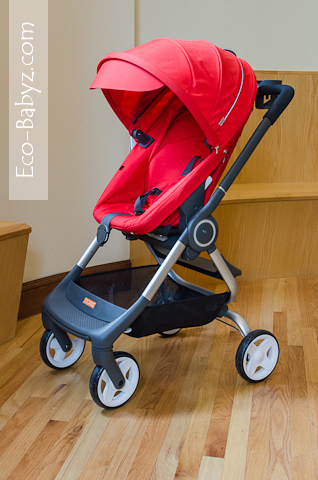 A very stylish stroller and looks comfortable for a variety of ages as well. I love that baby can face you or out and I love that it is so lightweight and easy to open and close! I am so in love with this stroller. The sun shade is huge and that means a lot to me when it comes to buying a stroller due to keeping baby shaded. I love the simple one handed fold. And the easy one foot brake is very nice as well. What a stylish and fabulous stroller. I love the color as well. Not only it is stylish, but has some cool features and easy to fold. Oh how I want one! Excellent video. It really demonstrates how cozy this stroller is. The baby looks so calm which is a testament to how great the Scoot is. I particularly appreciate how easy it is to close the stroller while still holding the baby which always seems really difficult for me. I also love the safety indicator feature. Looks like another win for Stokke. i love how small it folds down to and how i can have either my three month old in it or my 3 year old. This stroller has it all comfort, versatility but more importantly the durability and safety first features. We have to protect our precious cargo - owing this does just that ! Thank you for the honest review. I appreciate that you included the things that were not so perfect, but it still looks like an over all great piece of work. The extendable handle will make it easier for my husband to use. Being so sleek and accommodating, the designer MUST be a parent to have included such needed features in this stroller! I appreciate the adjustable handle, adjustable foot rest and the lightweight, compact design - awesome! That stroller is so slick, wish I had $700 budgeted for stroller. Being able to turn the seat is awesome, it folds so small. this is a dream come true stroller for my husbands and mine lifestyle! makes the travelers jet setter goals that much easier! this stroller is pure perfection. i love the high seat! so convienent! What an awesome stroller! I especially love that you can have baby facing you, that's always bothered me about most stroller, that baby is facing away from you! Thank you for the review!! Looks like one awesome stroller! I love how you can EASILY turn the child to face you! What a great feature! I love how it has the option to face you or opposite. The color is so bright too, I love it! Folding is also important to me, we have a smaller trunk in our sedan and the stroller I recieved as a gift for my baby shower, was so bulky, when it was in the trunk, that was all that would fit! So, I love that it isn't bulky and super easy to fold, most of the time, I am running errands or meeting with girlfriends so it's hard to hold my little one while I attempt to fold the stroller, this one looks super easy!! Thanks for being open and honest about the price. It's the only reason I don't have one. As a baby-wearing mama myself, I love to be able to see my little one. Would be great for condo/city living! I love how the baby can face you, and that it can double as a high chair in a restaurant! I love how it folds so small, the reversible seat is one of the best features! It looks like a fun stroller not just for the child but for the parents too!! This stroller would be a dream come true for this mommy! When my son was born, I purchased what I thought was a higher-quality brand of stroller, when in fact I should have done ALOT more research on the topic. His stroller is heavy, awkward, bulky, and a pain in my rear. Lol. He is two now, but I really really would love a new stroller for him that is suitable also for toddlers. This stroller look sooo amazing and comfy, and simple. :) I LOVE IT! This stroller is awesome! I love everything about it! I love how easily it folds and I love the reversible seat!! I love this Stroller! My sister has it, and I want one so bad for our first baby coming soon :) It's high-quality yet stylish. It has storage room which makes it comfy. The child can be facing you (a feature I like) and folding it is easy. A truly wonderful stroller. This stroller is awesome! I love the easy fold. I love that it can be folded with one hand the reversible seat attached. Our current stroller also has the reversible seat (a feature that was on my "must have" list while stroller shopping), but the seat has to come off prior to folding it and it usually takes 2 hands and a couple attempts to get it apart. I wish I had seen the Scoot when we were shopping! I think this might be the first review I've ever read of a stroller that claims to be one-hand foldable in which the reviewer could actually do it herself! That alone is enough to recommend it - but I also love the compactness! This stroller is amazing! I think it may just be the best I've ever seen and as a mother of three and grandmother of almost four I've owned several. This stroller is versatile, easy to use and so compact. All I can say is wow! Great and thorough review, Thank you! This stroller would be great for my new little man. It has everything I'm looking for in a stroller...easy fold, big storage, compact, and child can face you. I really like the 50# weight capacity, most strollers are about 45#. I too am a huge fan of reversible seats - love having the ability to look at my little guy. Also find it really helpful when he needs to take a nap. I find that facing him towards me eliminates a lot of stimulation and let's him fall asleep easier. Wow I can't believe how nice this stroller is. It is so compact. I would love to win this for a friend that is having a baby. I have a seven month old that is used to being worn in a carrier, but extended trips are now getting harder due to her getting heavier. This stroller looks perfect! Not only is it the perfect mesh of style and class, but who doesn't love a one handed fold. I love that it's a comfortable seat! Nothing worse that having a stroller that a baby hates! And that basket looks amazing. Love having storage room. Thanks for sharing your honest thoughts! I love how compact it is. It's hard going places with a big stroller, so this looks awesome! I also love the design and all the little different features! Wow! This stroller looks like it would be awesome to use! I love the fact that is has all the features of a full sized stroller with the fold of a smaller one. The seat also looks very comfy! When I got my first stroller I hated that it faced out. I told my husband I wanted to design a stroller that let you face either way. Apparently they heard my comment! I'm really excited to see this available. I love that one hand fold. Absolutely essential for me. Also, I love how much space the Stokke has for storage! I have a big diaper bag that never seems to fit anywhere. I tried to leave a comment earlier but I'm not seeing it show up so if this is a repeat please forgive me! The one hand fold is absolutely essential to me! I also love the Stokke's storage space. I have a large diaper bag that I could never give up, and it never seems to fit anywhere. With the Stokke, it looks like it would easily fit. Wow! I love how small it folds up too!! And the fact that it's seat is reversible. How cool is that!! And I love that it has 5 seat positions. My little guy always looks so uncomfortable in his stroller. I LOVE the look of this stroller! It has sooo many great features- great colors, the storage on the bottom is awesome and I love how cozy the seat looks. Great review! I actually haven't been a big fan of Stokke products before because they seemed all show and really uncomfortable... but this one is just awesome. First of the weight limit is great, my son is a big boy and has really become almost too big for his current stroller and he is not evern a year and a half! The storage is great for my huge diaper bag and the fact that it folds to become so compact is awesome! Seriously a great great product! I love love LOVE that this stroller includes the mosquito net and rain shield... typically expensive add-ons which EVERY mom will need! On top of that this stroller is adorable, super stylish AND functional. What more could you want!? This looks like a great, comfy, easy to use (and not to mention, stylish!) stroller!! What a stylish and well-made stroller. It looks really functional too, especially the large storage area underneath. Not only does this stroller look stylish it is so versatile. It looks like its really easy to move around and it truly does have a easy one handed fold..unlike other stroller that say they are and they are too bulky to fold unless you use both hands. Your little man looks like he is so comfortable and safe inside the seat that looks like a cocoon. They really have thought of everything when they designed this stroller. This stroller looks amazing. I love how the child sits higher up than a normal stroller, which then leaves more room underneath for storing diaper bags, etc. I like the fact that the stroller is lightweight and one handed. I also like that the seat can face towards me. The one-hand fold and the adjustable handle height are both awesome features! I am 5'11" so the height adjustment is important for me. this is perfect for me since I have osteoarthritis in my hands. Thank you for the review. I love that reversible seat and adjustable bar. And also the high weight allowance. That is a big plus. I love the reversible seat and adjustable bar. Also the high weight allowance is great, babies get big so fast. Thank you for the awesome preview. Nice video and review. I like how it's so easy to fold into a nice compact package. I also love the beautiful bold red color. I also like that it is easy to steer and control. I absolutely love that the seat is reversible. I can't believe how light this would be compared to our old behemoth stroller. I love this stroller. I really like that the seat faces in or out. I wish my stroller could do that. If I get another stroller (though this one is definitely out of the price range), I would like to have that feature. I also like that it has the option to add a sibling seat. I have seen a few strollers adding that option, and I think it is genious! Great review, I really like this stroller. I like the 4 seat positions. I love everything about this stroller! Thank you for a great review. I really like the different positions of the seat. Such a stylish and neat stroller! I like reversible strollers in the event my child wants to look at me. I love how stylish and functional it is! I also appreciate the large and sturdy canopy - perfect for the summer. We're currently shopping for a new stroller with a LO due this summer. An easy fold and in-facing option definitely put this one on our *want* list. We also live in the city, and it looks perfect for negotiating BART! I think it is incredible how compact it folds up! I also like the weight capacity for the ever changing needs of a growing family! Awesome stroller. I live in the city and use public transportation so this would be SIMPLY INCREDIBLE to own! I love how easy this folds up and how compact it gets! And its aesthetically pleasing! One thing I hate about my current stroller! Thanks for the comprehensive review. The more I read about it, the more I love it. However, as you mentioned, the value is outside our comfirt zone. Also under the 'To Make It Even Better', I thought the Scoot has an adjustable leg-support. Wont it help? I love that you can switch the handle positioning!! I'm so glad you made this video review, I have been wanting to see the recline in action, just how much the child is reclined. Thank you! This is such a beautiful stroller! That looks so easy to use! I love evrything about this stroller, how you can easily fold it, the 7 differents colors, the style, the accesories (like the double step) the way the baby can look at you :) it is the perfect stroller (too expensive for me but if I had more money I would buy this one for sure). I really love how secure the seat looks with the straps the way they are. I also love how it's easy to fold and has a lot of storage room. I love that you can have baby facing you and higher up than most strollers. When I'm not babywearing, this would be the next best thing. I like how it's lightweight and how you can fold it with one hand. Also the security of the straps and all the different seat positions are perfect. I've had other strollers that don't give a smooth ride and that's great to hear this definitely does.